Blossoms are one of Japan’s most iconic images. Though the sakura cherry blossoms are the most well known, they aren’t the only trees to produce beautiful flowers for a brief but lovely time. 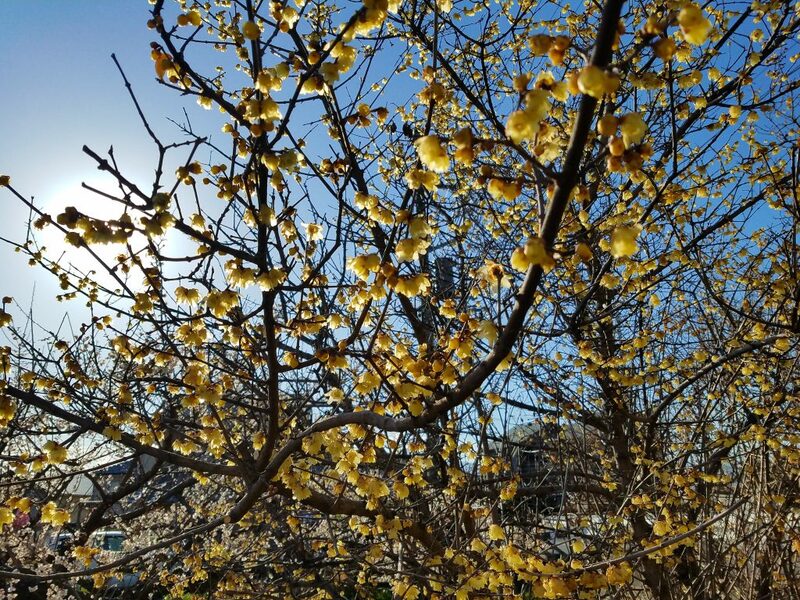 Dakota and Mac wax lyrical about the joys of ume – plum blossom. [All photos taken by Mac on his trusty Samsung Galaxy S7 Edge on Maction Planet Tokyo Private Tours in the last seven days and used with the permission of our guests]. At the start of spring, the new season is rung in with the blossoms of plum trees, the first trees to bloom as the winter comes to an end. Plum trees were introduced to Japan from China, and were the preferred flower of the aristocracy in the Nara period (710–794), until the Heian period (794–1185), when a preference for cherry blossoms began to emerge. Plum blossoms and cherry blossoms have a similar appearance, and indeed come from the same plant family, Rosaceae. The shape and distribution of their flowers are slightly different, however. 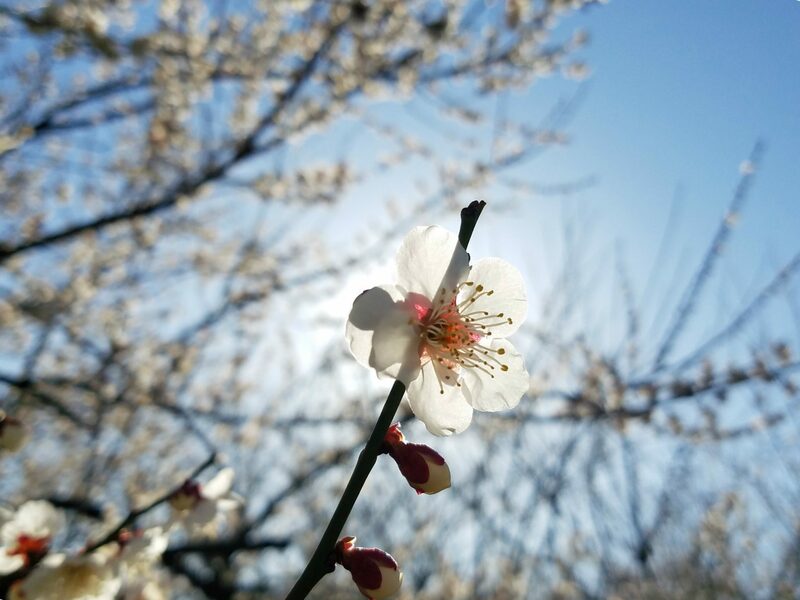 The petals of plum blossoms are rounder, whereas cherry blossoms are more ovular, and have a small split in the middle of their petals on the end. 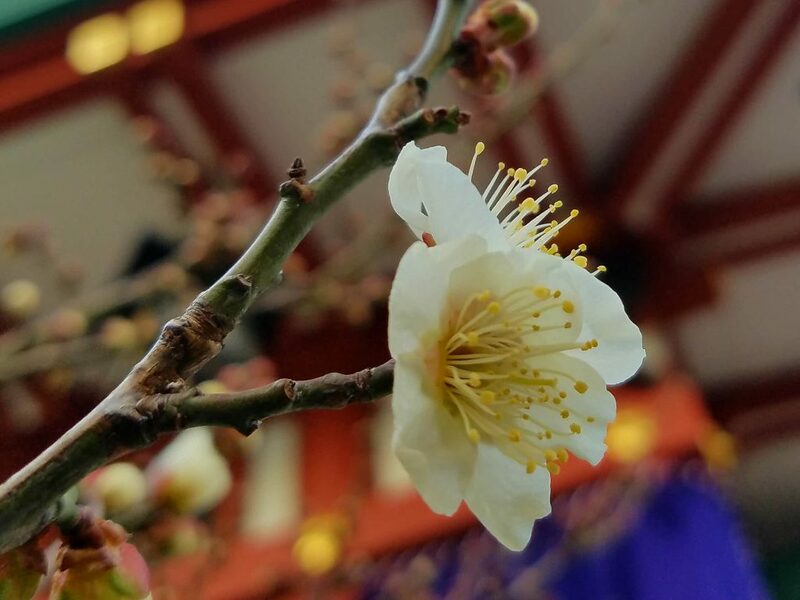 Plum blossoms grow directly on the branch, rather than off a stem like cherry blossoms, and are less dense throughout the branches. They also have a stronger fragrance, and a wider range in their colours. 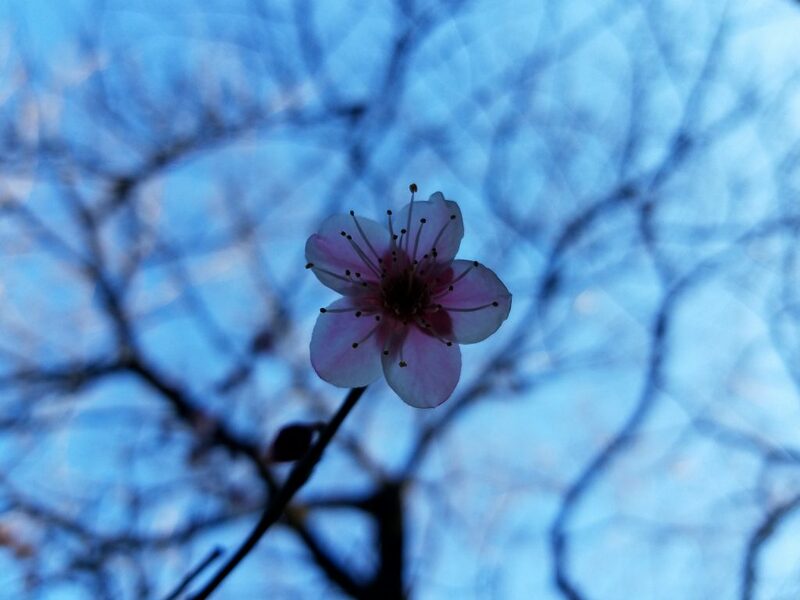 Plum Blossoms usually start to flower in early-February, whereas most cherry blossoms peak in late March/April. 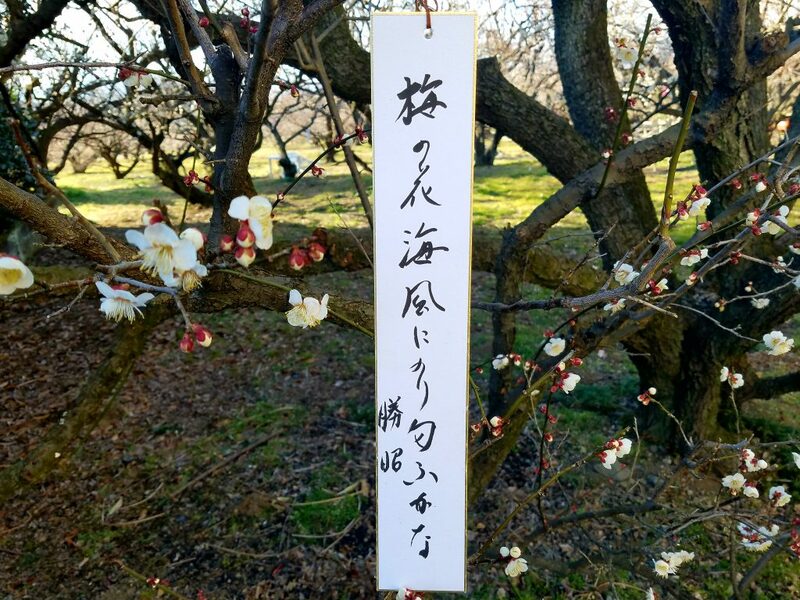 Much like the cherry tree, plum blossoms have also been selectively bred over time, leading to varieties such as the yae-ume, which has multiple petals, to the shidare-ume, or weeping plum tree. The blossoms have been widely celebrated in poetry and art throughout Japanese history, as symbols of good fortune.The plum tree is associated with maturity and longevity as it is itself long-lived, with some trees claimed to be over 1000 years old. They’re also traditionally thought to ward off evil, so they’ve often been planted in the northeast section of the garden, park or shrine, because that is the direction evil is thought to enter from. Plum blossoms are also a common Japanese motif seen on kimono, obi, happi as well as paper, fans, ceramics and paintings. 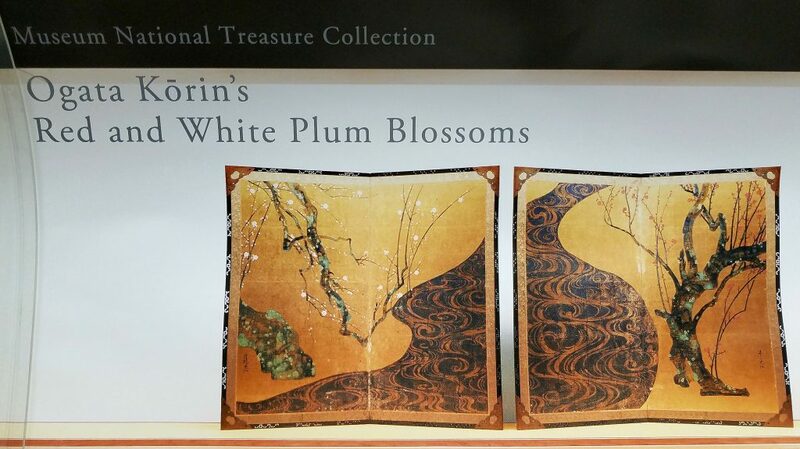 One of the most famous works of art featuring ume is Ogata Korin’s Red and White Plum Blossoms (1712-1713). It has been designated a National Treasure, the highest rank of Tangible Cultural Property in Japan. It is in the collection of Atami’s MOA Museum of Art, and in timely fashion is it currently on display until 13 March 2018. The work comprises a pair of uni-fold screens with two plum trees arranged asymmetrically against a gold-leafed background. It is acclaimed as one of the finest examples of traditional Japanese art. Korin, a master of the Rimpa school. created the piece using tarashikomi – a technique in which a second layer of paint is applied before the first layer has dried. This bleeding breaks up the colours and creates a dripping effect for details such as ripples in water or flower petals on a tree. There are several family crests (kamon) which use the Ume blossom motif. The most important of them all is the Maeda Clan. They were one of the most powerful samurai families in Japan, second only to the ruling Tokugawas in rice production and fief size, ruling the Kaga Domain from Kanazawa from 1583 until 1868. Firstly, at the beginning of spring/They sell Sake and ume blossom/And I smell them. The trees also play a role in Japanese cuisine. Plums are most commonly eaten in a pickled form called umeboshi. Umeboshi has a sour flavor, is typically eaten with rice, and can accompany various kinds of savory dishes. The unique, sour flavor of the plums can also be used in sweets, however. Wagashi, for example, the traditional sweets made with mochi and usually flavored to the season, are prepared with plum flavors in spring. 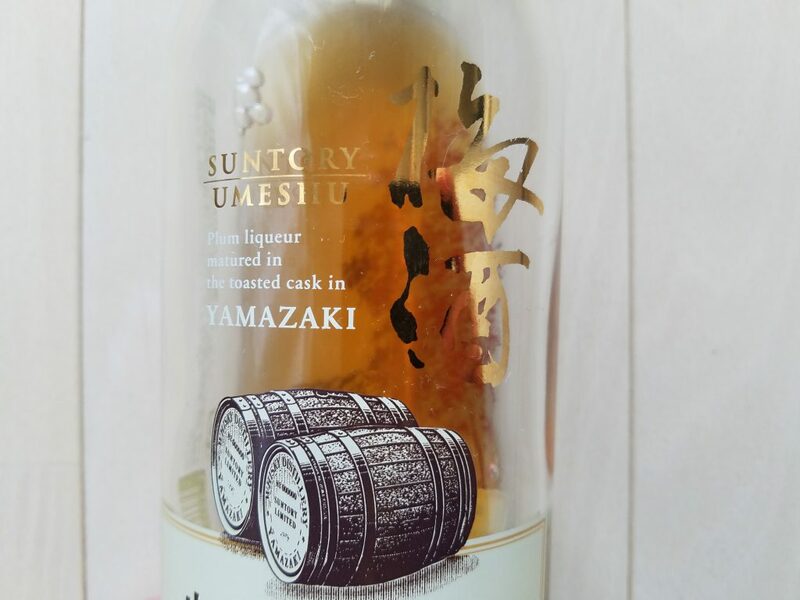 The plums are also used to make umeshu, a strong and sweet plum liqueur using shochu and sugar. While the trees are in bloom, many parks, temples, and shrines celebrate them by hosting Ume Matsuri, plum festivals. The festivals often feature tea ceremonies and live performances, such as traditional dances or musical performances. People often go out with their friends or family to spend a day below the trees and enjoy their beauty, local foods and a glass of umeshu. Kanpai! 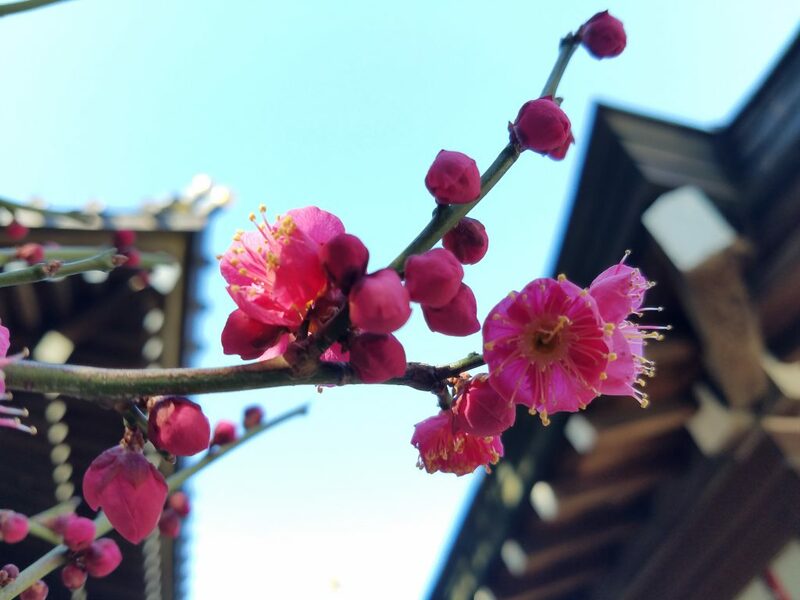 The beauty of the ume and their cultural significance make them a must-see on any Maction Planet Tokyo Private Tour and can be incorporated into any fully customised itinerary. Book yours today! Email info@mactionplanet.com to begin your perfect, personalised time in the World’s Greatest Metropolis.